When you think SEO, naturally you think Google. Some of you might even think Bing, Yahoo, Yandex, or Baidu depending on your target location. But the often-forgotten search engine when it comes to prioritizing your optimization efforts is YouTube. According to Alexa’s global traffic rankings, YouTube is the second most visited website in the world. It’s also arguably the second biggest search engine in the world that you haven’t yet properly optimized for — despite this very topic featuring at Mozcon over four years ago! Targeting your videos – Understanding searcher intent, keyword research and video creation. Optimizing your videos – Creating a branded presence, optimizing titles, tags and descriptions. Promoting your videos – Getting real, engaged views on your videos, building links and embeds to your videos. Google shows more than just articles in their SERPs. They also rank videos, images, books and more. The more content you create, in more varieties, the more you are increasing your chances of being picked up and ranked in Google SERPs for related search terms. Considering that Google owns YouTube, it does not come as a surprise that you can increase your organic visibility by spending some time optimizing your video content on YouTube and embedding videos on your website. It is important to know that embedding videos won’t directly improve your rankings in Google SERPs, according to Google’s John Mueller. However, having useful videos within your content can help you keep a visitor on the page longer. That should eventually help you increase your niche authority, which should see you increasing your organic rankings. In short, once your visitors see that your site is sharing informative and helpful content they are most likely to return. Thus, over time making your site authoritative and engaging source rewarded by Google. Based on your keyword research (explained further in this guide) you will be able to create video content useful for your targeted audience, that will result in your viewers seeing you as a trusted resource of information. Before we dive into more detailed steps on how to optimize your videos, let’s take a look at the main YouTube ranking factors. Now that we know what are some of the key ranking factors on YouTube let’s dive in and see how can you discover topics and how to optimize your videos to increase its chances to rank better on YouTube. The YouTube SEO process starts just like any content creation process, with a keyword, search query and topic research. If you are new to keyword research, check out Moz’s great guide on the topic or watch our very own ‘Wolfgang Bites’ and learn how can you ‘Read Your Customers’ Minds’. The goal you are trying to achieve here is to understand searcher intent, what kind of information users are looking for and which search terms are relevant to your business and your audience. An additional bonus would be to discover trending search terms or keywords related to your industry. Find relevant topics with high volume keywords and low competition. Is the keyword relevant to your website’s content? Will searchers find what they are looking for on your site when they search using these keywords? Will they be happy with what they find? And, will this traffic result in financial rewards or other organizational goals? Now that you know how to do keyword research, let’s see how can you discover your potential keywords using YouTube. To start discovering industry related search topics, you can use YouTube’s search suggest feature. Just type something into YouTube search and you’ll see a list of suggested topics appear. If you have the Keywords Everywhere Extension plugged in too, you’ll even get some additional competition and volume information too. It doesn’t matter if you use MS Office Excel or Google Sheets, as long you create a database with search volume for your targeted keywords. Once you have at least 50 different keywords, you are ready to make your analysis. Based on your analysis, you should be able to discover which keywords are more valuable to you. Bear in mind that by using YouTube’s search suggest you would have to type the data in your sheets manually for each targeted keyword. Considering that this process can be time-consuming, we would suggest creating a database of targeted search terms (topics and keywords related to your services). Using tools such are SEMrush or Google Keyword Planner you will be able to discover the most valuable keywords. As an alternative to Google Keyword Planner you can use KeywordTool.io. This tool allows you to find keywords and you will be able to compare keyword search volume in YouTube, as opposed to search volume from Google. Another way of finding the industry related topics and keywords is to analyze your competitor’s videos. 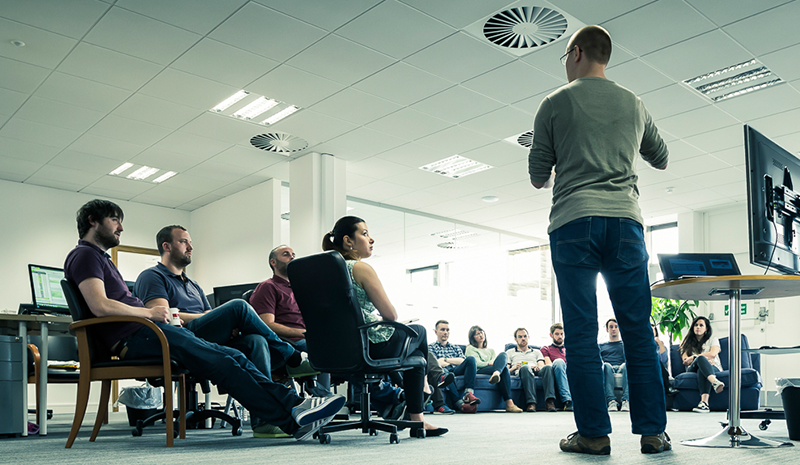 Analyzing their videos, you can discover topics, gather ideas and aim to create a better and more engaging video. Your ultimate goal here: ‘Steal’ their viewers. The process here is rather straightforward. Visit your competitor’s branded YouTube profile and see which videos have the most views and comments. Analyze the keywords and topics they’ve used for their best performing videos and 10x it! Make it better! Vid IQ and TubeBuddy are freemium browser plugins that allow you to spy on competitor tags, while providing additional performance data about selected YouTube video. Using one of these tools should help you discover what tags and keywords are your competitors use when uploading their videos. Using your business’ YouTube search report, you can discover how viewers are engaging with your content, a total watch time, average view duration, a total number of views, etc. 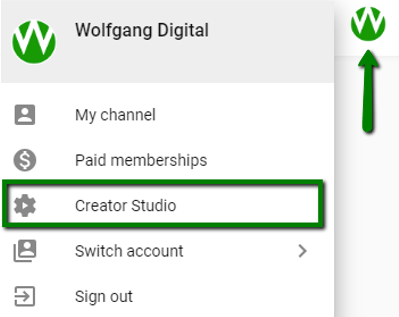 To view your YouTube analytics, navigate to Creator Studio Dashboard from your profile image (top right) or click here, once you’re logged into your YouTube account. You will be able to see which search terms were used by viewers on YouTube to discover your content. Based on your previous keyword research, you should be able to notice if you’ve missed any important keywords. Additionally, with knowing how users are discovering your videos, you will have a clear picture of what your most important keywords are for targeting purposes. When you compile a group of targeted keywords for your video, it’s time to see the amount of search volume for each keyword. It’s good practice to ensure that target keywords generate at least 100-1k searches per month in Google. 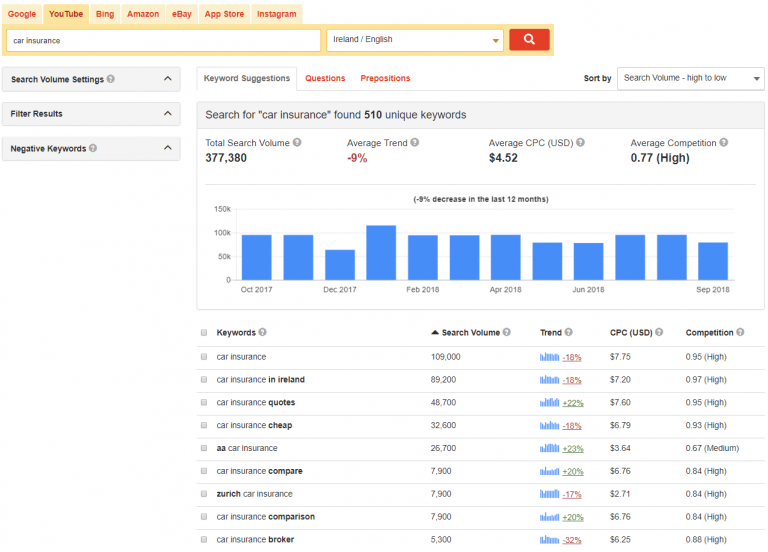 While it is a good practice to discover keywords with high search volume (at least 100-1k searches per month), it is important to know that some topics or industries don’t generate high search volume. So, knowing your own industry this should not come as a surprise. You can prioritize your keywords even if the search volume is below 100-1k searches per month. Using Google Keyword Planner or KeywordTool.io you will be able to pull search volume for your targeted keywords. Once you have a set of 50 – 100 targeted keywords, you can set up a campaign to track your YouTube rankings. One of the tools that allow you to track your rankings on YouTube is Rank Tracker from Link Assistant. Similar to Google SERPs rankings campaign in Moz, Rank Tracker will show you performance and rankings for your YouTube videos. At Wolfgang, we often say attention is the modern digital commodity so you want your video to retain a viewer’s attention for as long as possible. This means your video content needs to be high quality and engaging. In short, if your video keeps viewers on YouTube, the chances are increased that YouTube will rank your video higher in the platform’s search results. Additionally, responding to people’s questions or comments on your videos can create conversations that help your audience learn more about your company and the topic of your video. Knowing how your viewers think can be used to create in-depth and topically related videos or content for your blog. Using Google Trends can help you determine when is the best time to share your videos with your audience. Sometimes, optimizing your YouTube videos might even feel like you’re going back in time and optimizing for Google Search a decade ago, roundabout when Susan Boyle was setting YouTube alight with her mind-blowing Britain’s Got Talent performance (the most watched clip of the year, amazingly!). To increase your video’s chances of striking the high notes and being picked up by search engines, every YouTube video should have relevant title name and description along with the ever-critical relevant tags. It’s important you don’t simply create video content for the sake of it. Always stop to consider whether or not the content will be helpful for your audience. Also, check if there is a similar content out there and ask yourself how can you create something like this, but better. Try to apply 10X content strategy on your videos. Keywords and search queries are just as important to YouTube as they are to Google. As touched upon earlier, once the targeted keyword has been selected and a relevant video has been created, including metadata in your videos is important. Considering that YouTube cannot fully index the content within your video, it needs to rely on the content you provide. The title, description and tags will help influence where and when your video appears in YouTube search results, as well as within the actual vocal copy of your suggested videos. We’d highly recommended that the video title is at least 5 words long and up to 70 characters in length. Having a catchy, relevant and descriptive video title will enable you to include targeted keywords. If possible, placing the targeted keywords closer to the beginning of the title is recommended. However, keep in mind that your video title should entice viewer to watch your video. Keep titles concise (between 60 and 70 characters) with the most important information up front. Save episode numbers and branding towards the end. While video descriptions can be up to 5,000 characters in length, you should ensure that the key message is at the beginning of your description. 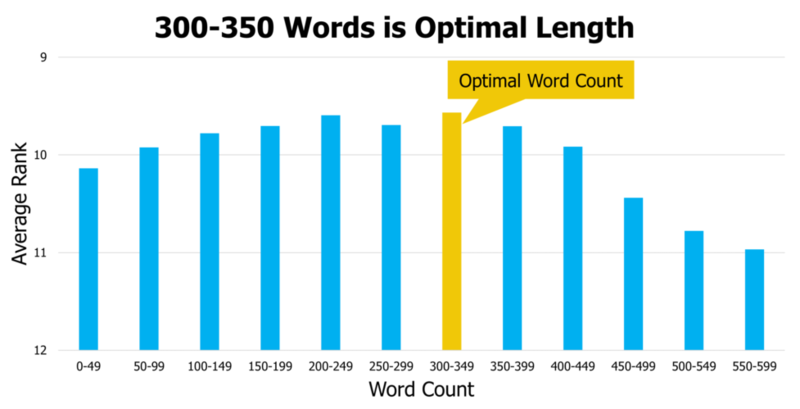 In his YouTube study, Justin found out that the optimal word count is between 300 – 350 characters long. A tailored video description can even attract some views coming from Google results. Using search terms in your video description that are searched on Google, not just on YouTube. The description can also help drive relevant traffic to your website. Including a link to your domain within your video description can bring additional traffic to your site. A tag is pretty much just a keyword that you add to your video and it can help you grow your YouTube audience. You need to ensure that your tags precisely describe the topic and content of your video. Including relevant and related keywords should help you gather more views. Create tags that are based on your topic and are relevant to your targeted keyword. If we take these four keywords and if you look at the search volume, it becomes quite clear which keywords you can and should utilize within your tagging logic. If you don’t have access to any paid keyword volume tools and perhaps find Keyword Planner a little cumbersome for this task, you can use Keywords Everywhere to find out the search volume for each keyword, free n’ easy within the SERPs. Use the data discovered in keyword and tag research and use it when creating video titles and video descriptions. When you have a verified YouTube account you are able to upload your own image for your thumbnail video. Which means that you can edit your image to make it stand out from other videos in your niche. It is recommended to use high resolution image for your video thumbnail – width: 1280p and height: 720p. However, it is important to know that there’s a limit of 2MB and the supported thumbnail image formats are .JPG, .GIF, .BMP, or .PNG. Once you upload your video you will see an option to choose a Custom thumbnail under the “Video thumbnails” section. 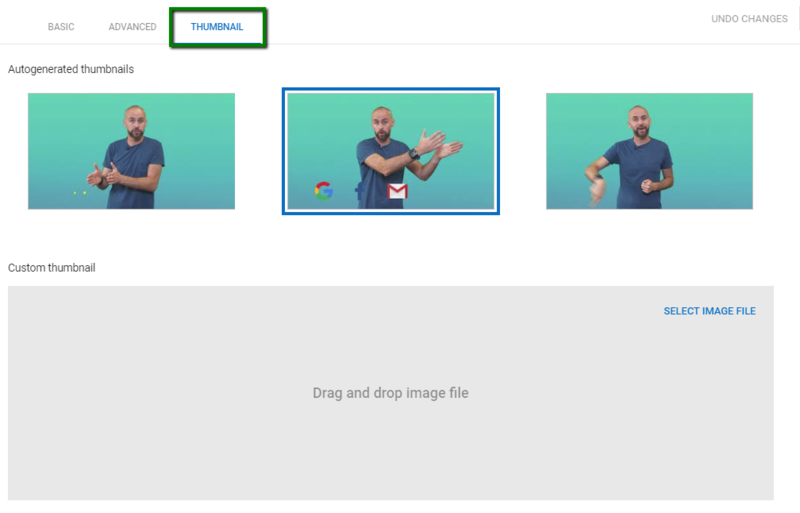 You can also upload the thumbnail image for any of your previously published videos. Using YouTube SEO Checklist can help you track your video optimization steps and help you optimize your video to give it a better chance to rank higher. Unfortunately, this extension is only available for Google Chrome. In the opening section we’ve mentioned YouTube’s ranking signals, where we listed video subscribers, video shares, comments and Click Through Rate as important ranking signals (engagement). To increase the number of users that will watch, subscribe and share your videos, you need to promote the video content also. You have to reach the audience. By incorporating YouTube content into your ongoing marketing strategy for your business, you are increasing the chances to draw more visits and views to your branded YouTube channel. The more views and engagements you have on your videos, the more authoritative and relevant your videos are in Google’s eyes. A simple link to your video in your email signature can be an effective driver of traffic. As mentioned earlier, comments, shares and likes (thumbs up) are important ranking signals. Considering that your email recipients are most likely your service users, they are the audience most likely to be interested in video content related to the news and services that your business provides. Furthermore, a satisfied customer will more likely share the video if they find it useful. Creating some written content on your website gives you the opportunity to embed the YouTube video or recommend that readers watch your video to find more information. This creates another link between your site and the video for Googlebot to consider. Embedding videos in blog posts or landing pages is the most direct and advantageous way to integrate your content and YouTube videos. When you include videos in your articles, your posts become more dynamic and engaging. Writing new articles, related to your video topic, can help you reuse the same video content multiple times. Presenting older videos to a new audience will help you gather more views, subscribers and engagements in general. You can follow Google’s own guidelines on embedding YouTube videos. Perhaps one of the simplest high-value feature inclusions you should embrace on your YouTube page; the utilization of playlists as part of your optimization strategy. Playlists can be excellent for garnering that ‘snowball effect’ and to help keep users clicking and rolling through your semantically related videos with ease. They help ramp up the view count and generally tend to rank higher than standalone videos in the search results, making them a no-brainer for inclusion in your YouTube optimization arsenal. Therefore, assuming your video quality is of a high standard of course, spending some time to optimize your videos for your potential YouTube in terms of quality and searchability should see your videos attract more views and dominate that vital second search engine that we as SEOs are often quite guilty of neglecting — never more if you follow these steps to a tee! Last, but by no means least, we’d highly recommend that you analyze your current video performance using Google Data Studio and YouTube analytics. These tools allow you to discover how your content is performing up to date (average number of views, comments, watch time, thumbs up, etc) and to generate reports after you optimize your videos with custom thumbnails, video tags, tailored video title and description. Mastering the art of calculating your overall watched time on YouTube is important, especially if you’re comparing stats versus other social video ad platforms. While a number of great rank tracking tools can help you track your YouTube rankings for your targeted search terms, you can use integrate their API feeds with Data Studio to create daily, weekly or monthly performance reports. It shouldn’t be hard, but you need to know your way around Google Data Studio to configure this report. Using the information provided above, you should be able to start creating video content that will be informative and useful to your targeted audience.